Today, I am excited to introduce my new 'Recipe of the Week' blog series. Join me every week as I will be sharing with you one of the delicious recipes to have recently come out of my sunny raw kitchen. As we're now at the heart of peach season, what better way to launch this yummy series than with a scrumptious cobbler? Beware you peach lovers! These never tasted so good! Put 5 peaches and the rest of cobbler ingredients in food processor, then pour into a glass casserole dish. Add 2 more peaches (chopped into bitesize chunks) to the dish, then crumble the topping on top! Place in dehydrator at 105 degrees for 2-3 hours. Deliciouso!!!!!!!!!! Just wanted to make a side note.... I have made it 2 ways now. One putting it in the dehydrator for 2-3 hours, and the other just putting it in the dehydrator for 10 minutes. My mother in law is here visiting , and tried it both ways and she really , really liked it better with it only in the dehydrator for 10 min.. So there may be others also that would enjoy it better this way too. 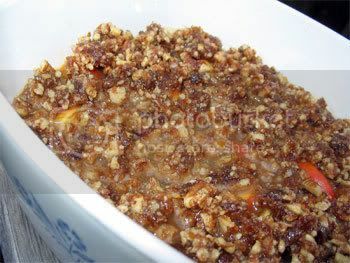 ~ If you find the cobbler a little too wet, simply add more peach chunks by hand before putting crumble topping. ~ Instead of making the cobbler in a pie plate or large dish, try using small ramekins or bowls for individual portions. PS Check out Derek and Sara's blog for an absolute stunning rendition of this dish! Between Sara's magical creations and Derek's photography, what a team these two are!!! i made this incredibly tasty deliciousness. thank you for this wonderful recipe. had to come back and post again. made this delicisousness again. it is so amazing. MMMM - Told my husband if we all like it we'll have to become raw foodist - It was sensational! My hubby and 3 children and I loved it (my baby is asleep, so she hasn't gotten a taste test yet). I made a little change. I added a bit of salt to the topping as I love sweet salty and used honey instead of the agava syrup. Thank you so much for this wonderful recipe. Can't wait to try others! What about soaking the peacans, shouldn't we do that? I usually try to stick to the recipe in that regard as it can really alter the texture of the dish. However soaking nuts/seeds is always a good idea as it removes enzyme inhibitors, makes them alkaline and more easily digestible. In that light, what you can do is soak nuts and seeds overnight then thoroughly dehydrate them. That way you have sprouted nuts/seeds ready to use in any recipe calling for them dry.